The tenacious grip of big, juicy hop aroma and character slides smoothly into rich, dark malts. 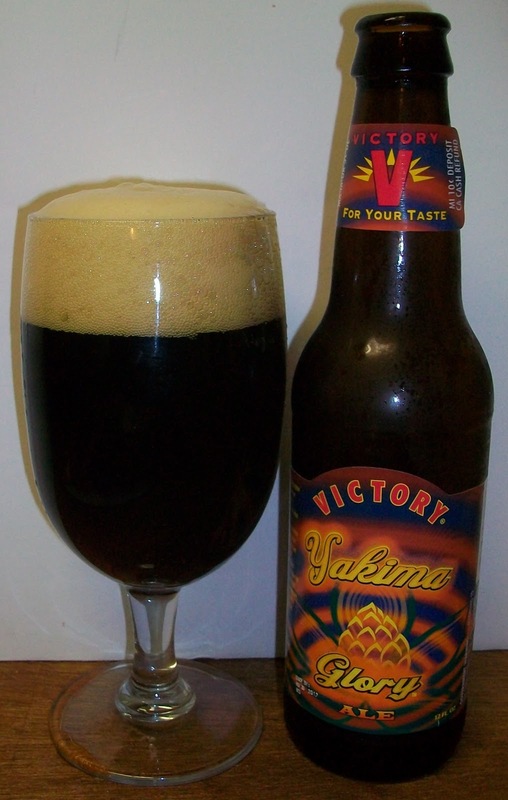 This heavyweight battle between fresh, Yakima Valley hops and dark, roasted malts is resolved harmoniously as the flavors merge to deliver complex satisfaction with a warming edge. Bask in the “glory”­ of the bright and brassy hops! I stopped in State Line Liquors after work on a Friday and found that there was a Victory rep tasting going on. I sampled this one and had to buy a 6 pack. From the tasting I was torn between an imperial/double IPA or a Black IPA. With only a few ounces in the cup it was difficult to get an appreciation for the color. So let’s give this a full review and see what Yakima Glory has in store for us. The beer pours a dark brown with burnt amber hues and a very rich off white head, highly effervescent with lots of tiny bubbles rising from the bottom of the glass. The nose is very intriguing with dark almost roasted malt aromas along with a complexity of citrus, pine and floral hop aromas. Wow, that a nice first sip. That’s an impressive black IPA. This reminds me of Otter Creek’s Black IPA. The experience starts out with dark almost roasted malt sweetness up front. That is immediately followed by a tingling effervescence over the tongue along with a building hop and malt robustness as the ale washes over the tongue in the middle of the sip. The robustness diminishes slightly on the back-end but there is a hesitation at the top of the swallow that is typical and expected. There is an additional carbonation release during the swallow that masks some flavors and cuts the robustness. Everything comes together for one fantastic finish. There rich dark roasted malts come through nicely and cut the rich hop complexity to leave a very robust but balanced enjoyable rich dark ale. The hop bite stays with you into the final aftertaste but there are also some dark malt flavors as well. This is a great beer. Rich, even robust but not over the top, it stays satisfying and enjoyable. The head has diminished to a nice protective layer over the top of the beer along with a thick ring around the top of the glass and very impressive lacing. This is a B+ for me. This is a very unique IPA; a very rich dark roasted malt ale with an interesting hop complexity of citrus and floral fresh hop flavors.